Experts say that - If driver is wearing seat belt, then would be in better control of the vehicle in any accident. A vehicle is bound to react in a un knowing manner in such case. Even if driver does not get thrown off, yet the focus for handling that situation would only decrease without seat belt. As the driver would have to struggle to keep himself in the right position behind the steering without seat belt. - As per the MV act for manufactures, airbags would only work, if the seat belt is strapped in its retractable lock. So one can evaluate no seat belts, no air bags. - Even if the average speed of the city is less than 15kmph, yet seat belts have a major role to play. He said that in case of a head on crash between two vehicles at 15kmph each the impact would be doubled i.e 30kmph. A 30kmph impact head bang into the windscreen is similar to falling from the 1st floor of any building. In recent spat wearing seat belts while driving in Himachal Pradesh has been made compulsory by the police. Though as per the Motor Vehicle act rule 1985 not putting on the seat belt was a traffic offence even earlier, but somehow it was never stressed upon by the authority. The common belief by many in mountains has been that seat belts should not be compulsory for hill driving. They say that in the hills bigger percentage of accidents occur due to going of the road. And in the situation where the driver is wearing his seat belt, chances of saving oneself becomes bleak. As putting on the seat belt reduces the odds for jumping or falling from the vehicle. Another common fact which most Shimla citizens justify for not wearing seat belt is that the average driving speed in the city is less than 15kmph due to narrow roads and related traffic woes of the city. Strapped in the belt would one keep waiting for the jam to move, they question. “Small circular road is not even 2 lanes completely with so many bottlenecks. Traffic woes are a regular feature here, then why does one need to wear a seat belt here? Questioned Rohit a Shimla citizen. He says that a seat belt could save us, but would be useful only when travelling at some considerable speed. “At less than 15kmph average, even if a head on crash happens nobody is bound to get hurt except the vehicles,” he added. Whereas expert SPS Garcha states that even though the common myth is different for the people yet, wearing seat belt while driving is safer. Even citizens of places like ‘Swiss Alps’ wear seat belts, he added. “In most cases only driver gets to know when a vehicle is going off the road, who in such a case is more focused on controlling the wheel. Even the co passengers would only know at the last minute mostly. If driver is wearing seat belt, then would be in better control of the vehicle in any accident,” asserted Garcha. He explained that a vehicle is bound to react in a un knowing manner in such case. Even if driver does not get thrown off, yet the focus for handling that situation would only decrease without seat belt. “As the driver would have to struggle to keep himself in the right position behind the steering without seat belt,” stressed Garcha. In such situation the only chance is that all wearing seat belts might survive with lesser injury. And in case of odds if one manages to jump off the vehicle, chances are that could get hurt multifold, he asserted. He said that the seat belts we use in India are retractable ones and only by press of single button it can release. He said that in case of any eventuality one can release it easily. “Though I am yet to find a person who had jumped off while the vehicle was falling down,” jibed Garcha. Normally people get thrown off, as they are not wearing seat belt, he added. Giving an example he said that his friend in USA who is a doctor is involved with Highway emergency services (deals primarily with highway accident cases) for more than a decade. Garcha said that this doctor has always remarked that ‘he is yet to find a dead body which was strapped in a seat belt’. Which proves that, wearing seat belt, reduces the probability of death in any such untoward incident, stated Garcha. “Moreover in today’s vehicles there is air bag safety. As per the MV act for manufactures, airbags would only work, if the seat belt is strapped in its retractable lock. So one can evaluate, no seat belts, no air bags,” he added. 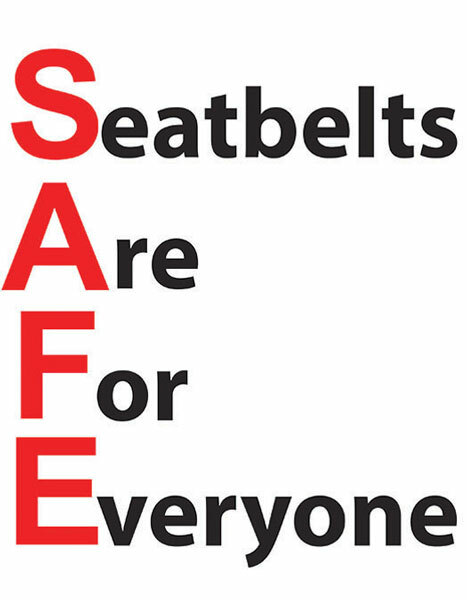 Garcha said that even if the average speed of the city is less than 15kmph, yet seat belts have a major role to play. He said that in case of a head on crash between two vehicles at 15kmph each the impact would be doubled i.e 30kmph. A 30kmph impact head bang into the windscreen is similar to falling from the 1st floor of any building, he explained.“Take the accident case of Princess Diana in the Mercedes,” exampled Garcha. After investigation it was found that neither Princess Diana, nor driver and the other 2 passengers in the car were wearing seatbelts. Only the gunman was wearing seat belt when this unfortunate accident occurred, and he became the lone survivor,” summoned Garcha.